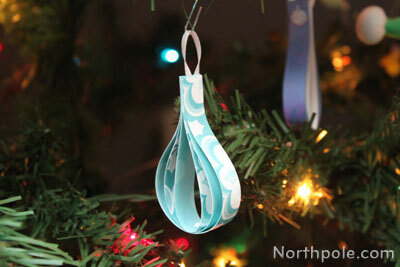 These simple ornaments are a variation of these paper ornaments. 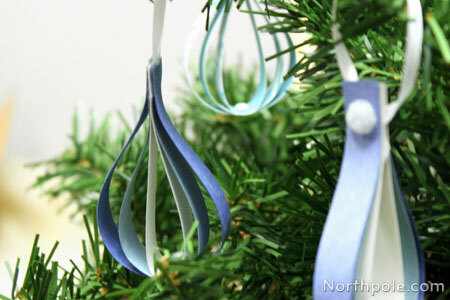 We made our teardrop ornaments with shades of blues for an icy feeling, but feel free to mix and match colors as desired. 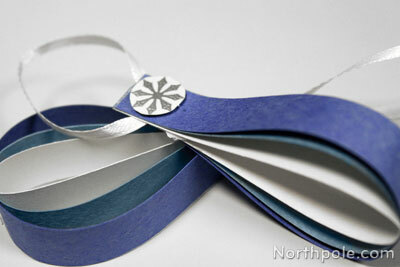 Try cutting larger or smaller strips of paper to create different ornaments. 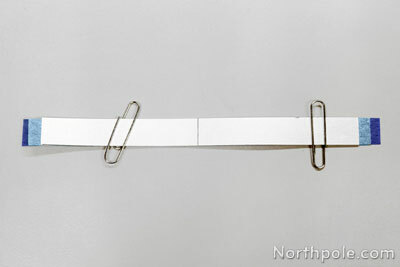 1 white – 0.5" x 5.75"
1 light blue – 0.5" x 6.25"
1 blue – 0.5" x 6.75"
Draw a light line at the halfway point on each strip. Stack strips lining them up at the halfway lines. 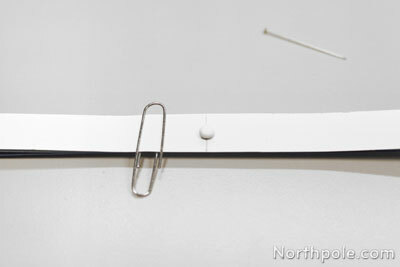 Use paper clips to hold together. 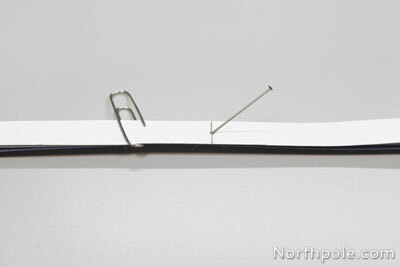 Using a pin, pierce a hole�in the middle of the halfway line. Then push a small brad through the hole, and separate the wings on the reverse side. Remove paperclips. 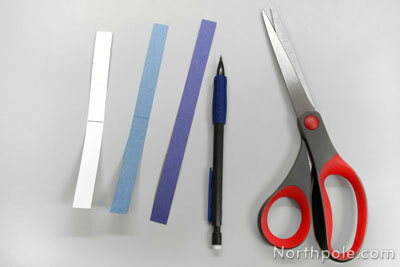 Gather the inner two strips and align the top edges of the strips. 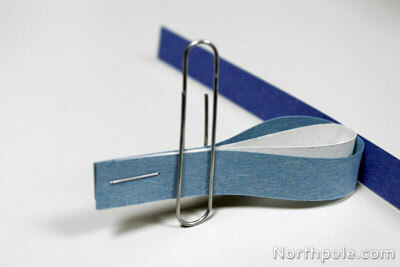 Use a paper clip to hold together and staple. Remove paper clip. 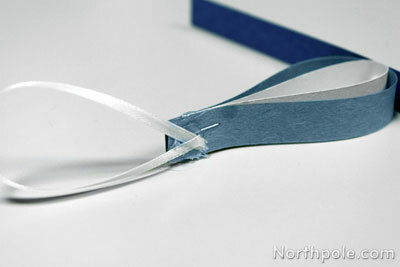 Cut a piece of thin ribbon that is about 5" long. 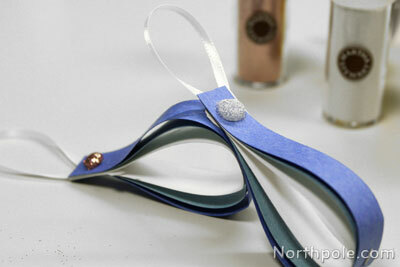 Fold ribbon in half and glue ends on top of the staple. 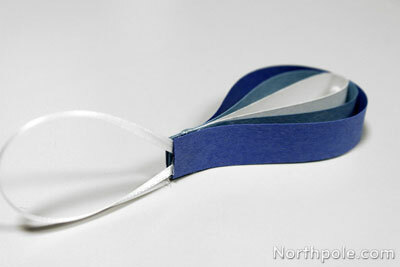 Fold up the remaining paper strip, and glue in place. Embellish the ornament however you like. 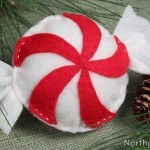 Put a dot of glue on ornament and immediately sprinkle with fine glitter. 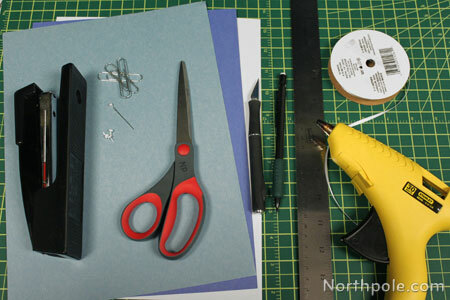 Cut out a small piece of decorative paper and glue in place.